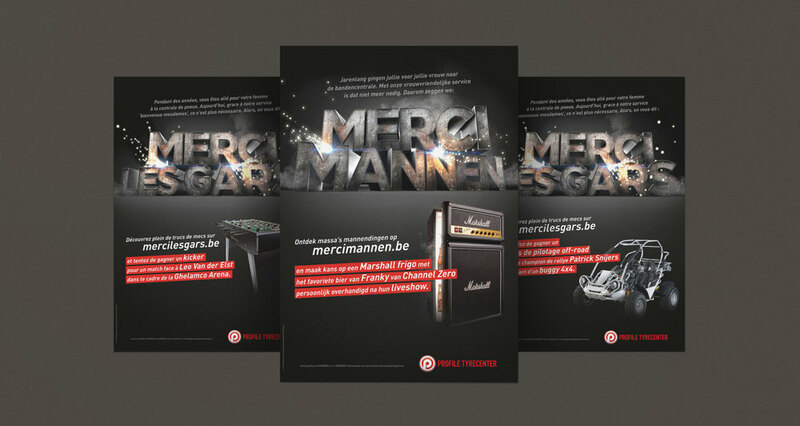 ‘Merci Mannen’ / ‘Merci les Gars’ is an integrated brand awareness campaign for Profile Tyrecenter. Profile offers a high level of comfort in each facility and peace of mind by its services. To emphasize this unique added value, we considered this from a feminin point of view. For years, most men took upon themselves the ungrateful task to take the family car, or their wives’ cars for that matter, to the tyre service centre. A tyre centre is commonly a very rough place where waiting in a dirty and noisy environment can be quite uncomfortable. Qualities that are mostly considered to be not so female friendly. Therefore we say: thanks guys. ‘Merci Mannen’ / ‘Merci les Gars’ is a unique online platform filled with loads of tough male content and exclusive give aways. Visitors can win exclusive sturdy experiences that build up cool male features, such as a soccer table, you use to play against a top soccer player, in Belgium’s nicest football stadium. Or an intensive offroad course, with a famous rally champion, in a high-speed 4x4 buggy. A first wave of three radio commercials announced the online platform and the give aways. During the months to come, a promotional campaign, using the same ‘Thanks Guys’ theme, will announce great deals on Dunlop, Hankook, Michelin and Continental tyres. When you buy a set of tyres, you’ll receive a great manly gadget on top. The campaign was also communicated via online advertising, social interaction and instore by large posters and flyers.